Whenever your company is preparing to work inside a trench at a job site, getting the right shoring equipment is critical to ensuring project success and employee safety. There are a wide variety of different trench shoring techniques and systems, but one of the most versatile and cost-effective is aluminum hydraulic shoring. Shoring is the process of supporting a structure during construction. For trench construction, many companies now use hydraulic shoring to install support beams, using hydraulic pistons that pump support sheets outward so they are firmly pressed against the walls of the trench. Aluminum hydraulic shoring is a great option depending on your project, because it’s lighter weight makes it less difficult to move around a job site while still providing the same secure environment for your crew. Renting hydraulic trench shoring equipment doesn’t just save you money on your project costs, it also gives you more options for types of trench shoring. We don’t just carry hydraulic trench shoring, we also have beam and plate, slide rail, and standard steel trench boxes. We even have specialty use boxes like the manhole box or build-a-box. We have the inventory , large selection, and it’s guaranteed to work. In contrast, if you buy, store, and maintan your own shoring equipment, you may not have the type of shoring you need and using your current may make the project more difficult, costly, or restrict you from bidding in the first place. Give TSR a call at your closest office: Phoenix, Tucson, El Paso, New Mexico, San Diego, or Los Angeles. We’ll even bring the equipment to your job site and train your staff for OSHA requirements. The old method of installing trench shoring required an employee to be inside the trench to install wood sheets and beams for support. It was labor-intensive, costly, and potentially dangerous for the worker inside the unsupported trench. For hydraulic shoring, the process is much safer. Workers can dig out a trench, place timber or steel sheets inside, and pump the sheets toward the outside of the trench using the hydraulic system, without having to place a worker inside the trench before it is properly shored up. Compatible with Different Materials Depending on the soil conditions and the project, contractors may choose to use either timber or steel support sheets for the outside of the trench. Timber used to be the preferred material, but today the versatility, strength and low cost of steel and aluminum shoring equipment have made them the most popular options. No matter which material you choose for your project, hydraulic shoring can make the entire process safer and more secure. 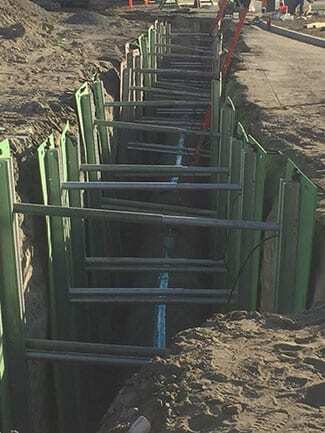 Hydraulic shoring is an effective method for creating a support system during your next trench construction project. Renting from a company that has a wide selection of hydraulic shoring equipment can save you time and money, and make your next construction project safer for your employees.